Hook and Liners–forget the flats if the water’s clear and the scallopers are out in force. Follow Meghan’s lead and catch some big fish close to shore! Natural North Florida’s recreational scallop season isn’t necessarily a bad thing for fishermen. 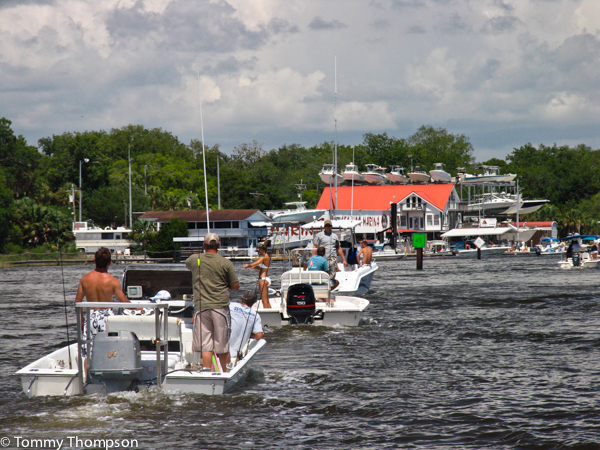 However, if you fish from Keaton Beach, St. Marks, Panacea, Econfina, Horseshoe Beach or Steinhatchee it can be aggravating. Those of you wishing to use launching ramps at these locations will probably find large, untrained crowds and those of you needing a motel room will find lots of “NO VACANCY” signs, or inflated “seasonal” room rates. Even beer, gas and sunscreen prices will be available only at premium prices. So—what can you do if you want to fish during “the season”? 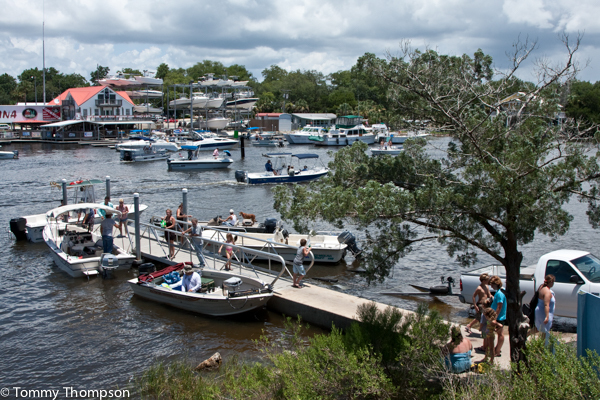 …as well as busy boat ramps and marinas! First, try fishing somewhere new. Bay scallops don’t usually appear at Yankeetown, Waccasassa, Cedar Key and Suwannee. These waters are not as clear or as salty as scallops prefer. And these are pretty good areas to fish between July 1 and September 10—with less-crowded facilities. 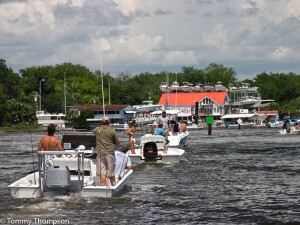 The inshore fisheries in Waccasassa Bay (north of Yankeetown), the Cedar Key to Suwannee area and Horseshoe Cove (between Suwannee and Horseshoe Beach) are all excellent for trout and redfish, particularly in the early mornings. These areas also offer some great wade-fishing opportunities. Consider a pre-dawn run, getting your feet wet and then throwing topwater plugs as the sun rises. Or, bouncing soft plastics off the bar edges up until mid-morning. If you’re used to fishing the crystal-clear waters on some Big Bend flats you may have to change your tactics and baits in these locations. I prefer darker lures in darker waters, particularly if I’m tossing soft plastics. D.O.A.’s Terror-Eyz in “root beer” color is an excellent choice for fishing oyster and rock bars. Also, these soft plastic lures are less likely to snag up on rough bottom, as they have upwards-oriented hooks. If you don’t want to try anything totally new, at least try out a new port and investigate some new flats. The flats to the east of Atsena Otie Island at Cedar Key, Red Bank and Hedemon Reefs at Suwannee and the flats to the southwest of the mouth of the Waccasassa River are all good areas to drift and fish for trout, Spanish mackerel and maybe a stray cobia or tarpon. Second, fish around the scallopers. 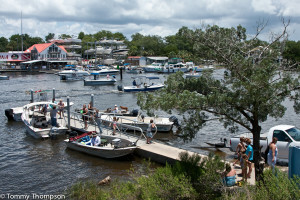 If you’re lucky enough to keep your boat at a “scalloping port,” get on the inshore waters early or just head offshore. You’ll likely not find scallopers in waters shallower than 3 feet or deeper than 8-feet. And there are even some inshore waters that are not usually “scalloped” on a regular basis. Time will tell as the season goes one—just look for the “flotilla” and avoid it. I’ve even got some spots that are on the regular route to some of the scalloping areas north of Steinhatchee that produce lots of fish—before the scallopers get out of bed! As for offshore, it’s 70-feet or better now for keeper grouper and reef fish. Scallop season doesn’t have to be depressing as resourceful anglers will always find a way to have a good time. Even if it means getting overboard!